Garlic, natural cheese and herbs. 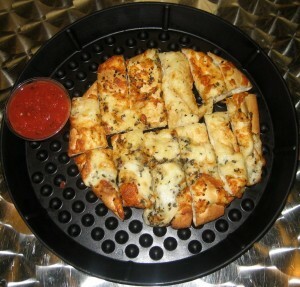 This cheesy-garlic bread tastes pleasant and is quite addictive. It was served warm and since we were hungry, we devoured it in seconds. A good way to whet your appetite and prepare your palate for some more savory flavors! With Italian sausage, pepperoni and cream cheese. These mushrooms may be small, but they are scrumptious little powerhouses! The flavors blend together effortlessly. In fact, we challenge you to eat just one. We kept popping these babies in our mouths – seriously good stuffing. Idea – if you were to have a small dinner party or romantic night in for two; Picture a nice creamy Chardonnay, cheese and cracker platter, some fresh fruit, and these delicious mushrooms! Grilled chicken, red onions, organic BBQ sauce, and garlic. We decided to get this pizza on a thin organic crust. This is a solid pizza. We could barely taste the BBQ sauce, and the thin crust seemed a little dry. We did learn that the BBQ sauce does not contain wheat – which may have contributed to its milder flavor. The thin crust here is still a little thicker than a typical thin crust…which is a plus! 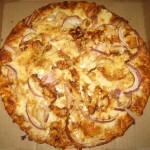 Promise Pizza uses all white meat chicken and fresh red onions, which collectively tastes wonderful. The chicken is soft and tender and the cheese is perfect. If you order this, just ask them to put extra sauce on it. With extra pepperoni and extra cheese. Trying to be brave, we ordered this one on a gluten free (extra $4) crust with daiya cheese (a dairy-free, vegan cheese). We were wary of the cheese, so one of the friendly owners (George) brought out an uncooked sample. Oh my…it was love at first taste! Using this cheese is a heaven-send for those of us who are lactose intolerant. The main ingredient is cassava – which comes from the cassava plant. It honestly looks, melts, and tastes like real cheese. It tastes as good cooked as it does shredded and uncooked. Onto the pepperoni now…they are giant, slightly crisp pieces with the right amount spiciness. How refreshing that they do not have a pool of oil on top of them, as most pepperoni pizzas do. This is an undeniably superb pizza. It’s important to note that their products are organic and fresh. For this reason, don’t plan to eat leftovers three days later. Although, this is a non-issue because the pizza is lip-smackingly good and you may scarf it down in one sitting! 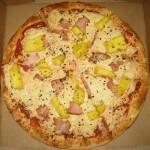 This one comes with extra cheese, basil, and topped with Canadian bacon and fresh pineapple chunks. We ordered this on a regular organic crust with daiya cheese. Hawaiian pizzas have long been one of our favorites, so we thought it would be a good idea to see how it measures up. Even though we ordered the regular crust, we noticed that the thickness was nearly identical to the thin crust. However, it is soft, moist, and baked to perfection. The organic pineapple topping is plentiful and fresh, but not overbearing. 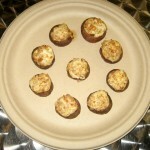 It complements the cheese and other flavors very well. We did find the amount of Canadian bacon to be lacking slightly and added only a subtle amount of zest. Still, this is a great pizza and is worth trying. 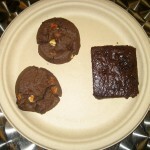 Both the brownie and the double chocolate cookies are gluten free. We really wondered if Promise Pizza could impress us with their dessert options. The brownie is a chocolate lover’s delight. This large piece of brownie is very fudgy and will make your mouth water, leaving you wanting more. This surpasses some chocolate treats that we’ve had at pricey restaurants! The gourmet cookie is double-dutch chocolate and comes two per order. This delicious cookie has both white and dark chocolate chips. The outside is slightly crisp and the inside is soft, giving it that perfect texture. We were excited and surprised at how great their desserts are, especially for a pizza joint! The service at Promise Pizza is fabulous. The staff treats everyone like a friend – and it’s just a very welcoming atmosphere. Since it was our first time and we had several questions, the owners (George, Bill & Clint were working that night) took turns responding to our inquiries. They were patient, knowledgeable and pretty humorous as well! As mentioned briefly before, when we were hesitant about the Daiya cheese, they offered us a sampling. We let the cashier know what we’d like, and she was efficient and did not mix up the complicated order. We were even checked up on during our meal, even though this is a seat yourself type of restaurant. We noticed that they came around a couple times and graciously gave diners complimentary stuffed mushrooms or garlic knots. We felt pampered here and it made our visit to Promise Pizza all the more enjoyable. Promise Pizza first opened in late-2009 in a new Round Rock strip-mall with the premise of being environmentally responsible and offering great quality products. We all know that running a profitable business is not easy, and owners try to cut corners often. However, Promise Pizza has gone above and beyond to fulfill their mission. This eco-friendly restaurant has a warm, earthy feel to it, with its bright green, brown, and orange color scheme. All of the chairs and tables are made out of recycled metal. The utensils, plates, and cups are highly bio-degradable. Their pizza oven is the most energy efficient available. The toilets are low-flow and the light fixtures use energy-saver bulbs. They use fuel-efficient Smart cars for deliveries, and the socially responsible list goes on-and-on. The restaurant is smallish, but is great for small groups. For a truly wonderful & unique pizza experience, be sure to stop by. You can even watch them prepare your order through the glass-enclosed kitchen! P.S. 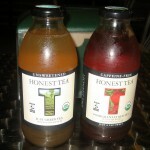 Wash that pizza down with some delicious Pomegranate Red Tea with Goji Berry! 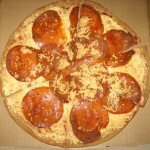 Thanks for the great review of Promise Pizza! Ever since it opened we’ve been hooked! My daughter is finicky with pizza but loves the cheese pizza and cinna-knots from Promise Pizza. The pepperoni is by far my favorite, but I’m going to have to break away and try the hawaiian now. It’s nice to have a place that not only cares about making good quality all-natural food, but also for the environment. We love seeing the smart cars around town! Looking forward to taste some of this great food soon after we land in Austin. Please save a Brownie and a couple of cookies for me. I already know what I want in my Promise Pizza. The pizza was good although they were alittle skimpy on the toppings. We had the Lone Star and substituted Italian sausage for the pepperoni. We’ll probably try them again and see how it goes. Maybe they were just having a bad night. My husband and I ordered our first Promise Pizza recently (we had it delivered from the 183 location in Austin), and we were really impressed. We try to eat organic whenever possible, so knowing that all of the veggies and most of the crust ingredients are organic, plus the meats are all natural (no antibiotics or growth hormones) was great. We ordered a large thin wheat crust pizza with their organic tomato sauce, Italian sausage (made from chicken), red onions, bell peppers and mushrooms. It was just fantastic, and reasonably priced especially considering how much more expensive organic ingredients are. Loved that it was delivered in a super fuel efficient SmartCar. This is our new pizza place!